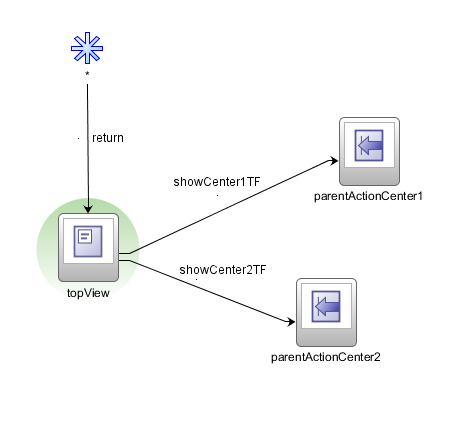 When you use Task Flows in your ADF 11g Web Application then you probably need to have some ADF Region interaction with other Regions or its containing JSF page. 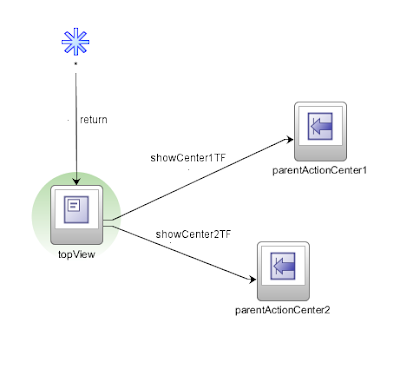 In this blogpost I will show you can control a dynamic Region from a other Region ( Task Flow ) with a Parent Action Activity. Off course you change the bean used for the dynamic region from backing bean scope to session bean scope and call this bean from every Task Flow. This works perfectly but you ADF has a better solution for this and you don't need to change the scope of the dynamic Task Flow bean. For this blogpost I made an Example with one JSPX page and this page contains two Regions. The first is the Top TF and the second is a dynamic Region with Center 1 & 2 TF. Start is part of the JSPX page and can call the Center 1 & 2 methods directly in the dynamic region bean. 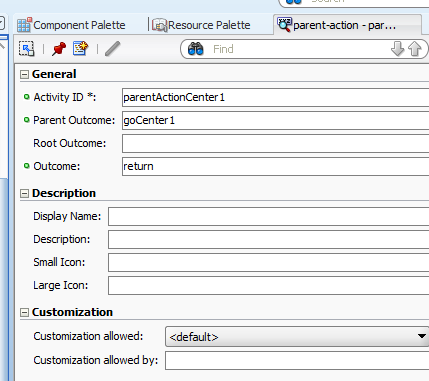 For showing the Center Task Flows from the Top Task Flow you can use the Parent Action activity. Here is the code of the main JSPX page with in the start facet ,the two buttons which can call the backingbean methods. 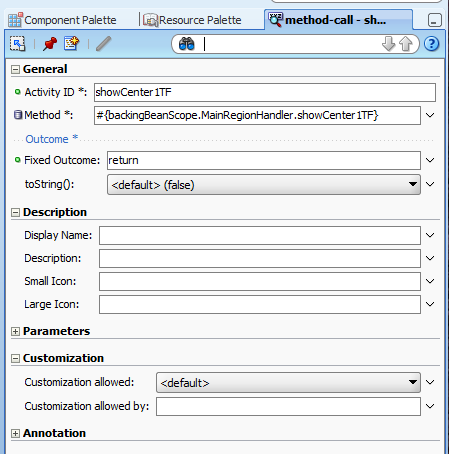 The dynamic region bean with the showCenter1TF and showCenter2TF methods. From the Start facet on the main page it is easy to show the right Center Task Flow. From the Top Task Flow you need to do more. First you need to change the parent Task Flow. ( this works in a bounded or unbounded Task Flow ). 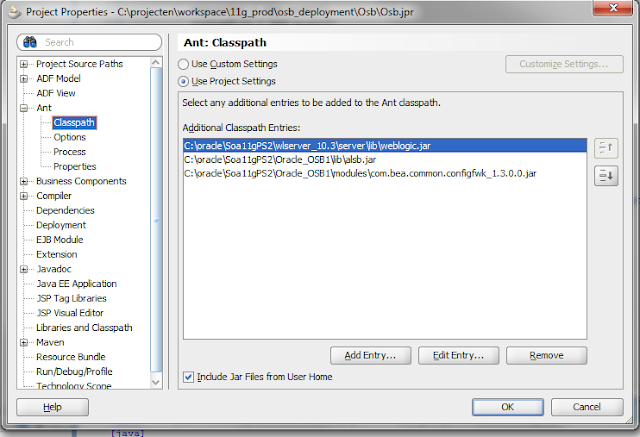 Add two Method Call activities and a Wildcard Control Flow Rule. 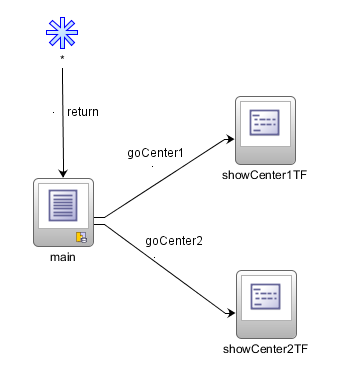 You will later call the goCenter1 and goCenter2 Control Flow cases from the Top Task Flow. This will activate the method call which call the right method in the dynamic region bean. After a successful invocation, it will use the return Control Flow case to return to the page. 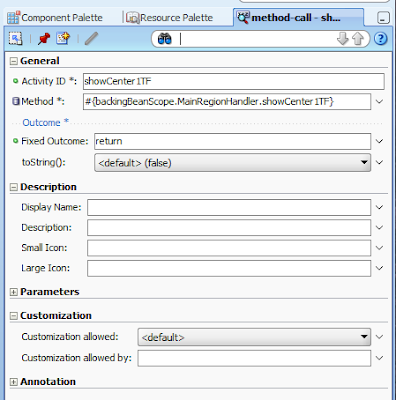 The property window of the showCenter1TF Method Call activity looks like this. Here you need to provide the Method value and provide the Fixed Outcome. Next step is to change the Top Task Flow where you also need to add a Wildcard Control Flow Rule together with two Parent Action activities. The Parent Action property window looks like this. Here you need to provide the Parent Outcome , this must match with the Control Flow Case of the parent Task Flow and here is the Outcome also return. And at last the Top fragment with the two buttons which calls the right Control Flow Case. That's all and here is the example workspace. For Oracle Service Bus 10.3 & 11g you can use the ANT / WLST deployment scripts provided by Oracle. With these scripts you can make an export 1 or more OSB projects from sbconsole, make a deployment / configuration plan and you can import a project jar to the sbconsole. And run your ANT task from JDeveloper.